Kenny Jackett admitted he was disappointed Pompey didn’t clinch three points against Wycombe Wanderers. 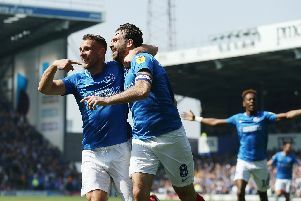 Brett Pitman thought he’d nicked a late winner with an 86th-minute header to give the Blues a 2-1 lead. Gareth Evans had equalised for the hosts to cancel out Bryn Morris’ first-half opener. But Joe Jacobson netted a penalty three minutes later to grab his side a 2-2 draw. Jackett was pleased with the application his troops displayed to battle back from behind. But he was disheartened Pompey couldn’t hang on to win the match. The Blues boss said: ‘We worked really hard to get back into the game. ‘We were 2-1 up on 88 minutes and disappointed not to have seen the game out. ‘Defensively it was a tough one to get a clean sheet – there were too many free-kicks against and then as they’re putting balls into our box there’s some danger. ‘We repeatedly got attracted and drawn to the header too many times and, ultimately, it has cost us.